Despite not playing, Dwight Howard had some funny remarks about the team he hates so much, the Los Angeles Lakers.This pitiful excuse for a team lost 99-87 to the Houston Rockets with James Harden having a big night and Jeremy Lin playing well, but it doesn’t matter when it’s part of a collective effort to lose as much as possible. Harden scored 37 points to go with 8 rebounds and 5 assists. It didn’t require a big game from Houston to easily win. They shot just 40% from the field. The Lakers? They turned the ball over 21 times (five by Clarkson), shot 7.7% from beyond the arc as Byron Scott made sure no positive momentum was held up for too long, fearing they’d actually have a shot at winning the game. How do you know you’re the best player on a team in tank mode? Byron Scott kept Jeremy Lin out of the lineup, bringing him in only after the Houston Rockets asserted a big enough lead and dominated. God forbid the Lakers win a game or two. Lin is the best player on this team now that Kobe Bryant is injured, and has probably been more helpful than Bryant since this season began, at least when given the chance to help out. 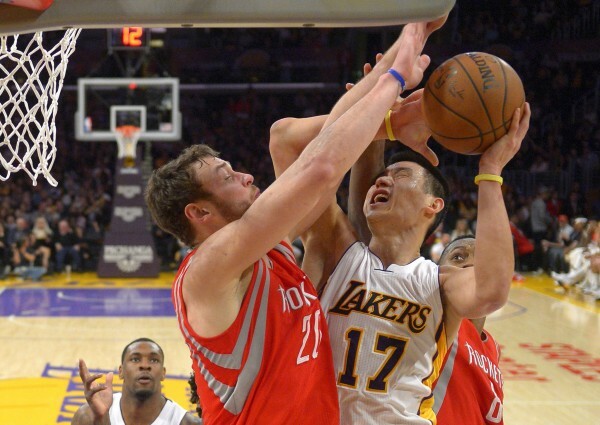 In 28 minutes, Lin scored 14 points and added six assists. Like the rest of his teammates, he didn’t shoot very well, hitting only 2-of-9 from the field, but he did quite well when attacking the rim, and looked very aggressive as he returned from the first ever DNP-coach’s decision of his career. As always, the Lakers were at their best when Lin was playing and not Jordan Clarkson or Ronnie Price, who found himself on the bench this time. The Lakers are now into developing their young players; not that they have too many of those. The only players signed for next season: Kobe Bryant, Jordan Hill, Nick Young, Julius Randle, Ryan Kelly, Ed Davis (player option), Robert Sacre and Clarkson, while Tarik Black’s deal for next season isn’t guaranteed. With that in mind, excluding Bryant who is out for the season and maybe for good, just like Steve Nash, look for these guys to get minutes whether they deserve it or not. But there are other considerations as well. Lin can only try and make the most of the minutes he gets. Why shouldn’t he play 33-35 minutes a night? Just because Scott has orders not to do too well. If a healthy Bryant gave the illusion of a team trying to win games, because Bryant has this perception of going of being a fierce competitor who can’t stand losing, all bets are off now. The players on the Lakers right now hate losing too, but they don’t have the media pushing them to become bigger than they actually are. Nick Young seems very unhappy with his minutes and his overall role with the team. He played just 8 minutes and made an abysmal effort on defense, not scoring a single point as well. This was his first game without points since joining the Lakers. Young didn’t play a single second in the second half, and left the Staples center without talking to reporters. Byron Scott’s job isn’t to make players happy or to even try and bring the best out of them. He’s simply here to make sure the losing isn’t disturbed. If in the first half of the season his incompetence made sure of that, the rest of the way he’s actually trying. Not very good news for players like Lin, who have their next contract, future and success to worry about.